We evaluated a biomanipulation program to test for short-term changes in water quality (chlorophyll a, Secchi depth, total phosphorus) and macrozooplankton biomass following partial removal of omnivorous gizzard shad Dorosoma cepedianum. The removal occurred at a eutrophic subtropical lake, and responses were compared to an unmanipulated control lake using a before-after-control-impact paired series analysis. The removal reduced the biomass of large (>300 mm) gizzard shad by 75% over 2 years via a subsidized commercial gill net fishery. However, the total population biomass of gizzard shad was reduced by approximately 32% from an average pre-manipulation biomass of 224 kg ha−1 due to the size selectivity of the gear, which did not effectively capture small fish (<300 mm). 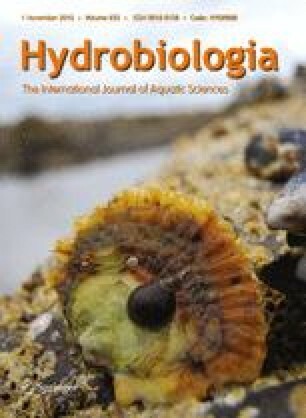 No significant short-term changes in chlorophyll a concentration, Secchi depth, total phosphorus concentration or macrozooplankton biomass were detected following biomanipulation. The partial removal may have fallen short of the biomass reduction required to cause ecosystem responses. Our results suggest that moderate omnivore removals (i.e., <40% biomass reduction) will have little short-term benefits to these lakes, and future manipulations should use a less size-selective gear to achieve a larger total biomass reduction. Many thanks to B. Baker, C. Barrientos, G. Binion, A. Bunch, M. Bunch, J. Dotson, P. Hall, G. Kaufman, E. Thompson, and A. Watts for assistance with sample collection and taxonomic identification of zooplankton. Walt Godwin and Brian Sparks of the SJRWMD were helpful with planning logistics for field work and providing portions of the data set presented here. The authors are grateful to the SJRWMD staff and two anonymous reviewers for helpful comments on drafts of the manuscript. M. Catalano was supported by a University of Florida Alumni Doctoral Fellowship. The research presented here was funded in part by the St. John’s River Water Management District, Palatka, Florida. Schaus, M. H., W. Godwin, L. Battoe, M. Coveney, E. Lowe, R. Roth, C. Selecky, M. Vindigni, C. Weinberg & A. Zimmerman, 2010b. Impact of the removal of Gizzard Shad (Dorosoma cepedianum) on nutrient cycles in Lake Apopka, Florida. Freshwater Biology. doi: 10.1111/j.1365-2427.2010.02440.x.